The elastic nature of synovial plicae allow normal movement of the bones of the tibiofemoral joint, without restriction. Yet, when repeating the same knee movement too often, such as bending and straightening the knee, or in the case of a trauma to the knee, these plicae can become irritated and inflamed. This can result in a disorder called the plica syndrome. It refers to an internal derangement of the knee which prevents normal functioning of the knee joint. It is an interesting problem, particularly seen in children and adolescents and occurs when an otherwise normal structure in the knee becomes a source of knee pain due to injury or overuse. The diagnosis might sometimes be difficult because the main symptom of non-specific anterior or antero-medial knee pain can point to various knee disorders. But if a plica has been diagnosed beyond any doubt as being the source of knee pain, it can be treated correctly. In the knee, 4 types of plicae can be distinguished, depending on the anatomical location within the knee joint cavities: suprapatellar, mediopatellar, infrapatellar and lateral plicae. The last one is rarely seen and, therefore, there is some controversy regarding its existence or its exact nature. The plicae in the knee joint can vary in both structure and size; they can be fibrous or fatty, longitudinal or crescent-shaped. Absent No sharp edged fold. Hole Plica extending completely across the suprapatellar pouch but with a central defect. The medial patellar plica is also known as plica synovialis mediopatellaris, medial synovial shelf, plica alaris elongata, medial parapatellar plica, meniscus of the patella or after its first two descriptors as Iion's band or Aoki’s ledge. It is found along the medial wall of the joint. It attaches to the lower patella and the lower femur and crosses the suprapatellar plica to insert in the synovium surrounding the infrapatellar fat pad. Its free border can have different appearances. As the medial plica is attached to the synovium covering the fat pad and ligamentum patellae, it also changes dimension and orientation during knee movement. The medial plica is known to be the most commonly injured plica due to its anatomical location and it is usually this plica which is implicated when describing the plica syndrome. Shelf A complete fold with a sharp free margin. Reduplicated Two or more sheves running parallel. They may be of differing sizes. High-Riding A shelf like structure running anterior to the posterior aspect of the patella, in a position where I could not touch the femur. A—Narrow non touch (never makes contact with the femoral condyle). B—Medium touch (touches condyle with knee movement). C—Wide covering (covers the femoral condyle). The infrapatellar plica is also called as ligamentum mucosum, plica synovialis infrapatellaris, inferior plica or anterior plica. It is a fold of synovium which originates from a narrow base in the intercondylar notch, extends distally in front of the anterior cruciate ligament (ACL) and inserts into the inferior of the infrapatellar fat pad. It is often difficult to differentiate the infrapatellar plica from the ACL. Mostly it appears as a thin, cord-like, fibrous band. 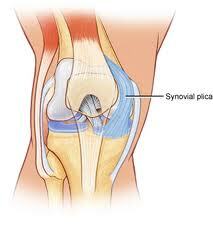 The infrapatellar plica is considered to be the most common plica in the human knee. Discussion is on-going whether this plica is structurally important to regular knee movement or whether it is redundant. Absent No synovial fold between the condyles of the femur. Separated A complete synovial fold that was separate from the anterior cruciate ligament (ACL). Split Synovial fold that is separate from the ACL but is also divided into two or more cords. Vertical septum A complete synovial fold tht is attached to the ACL and divided the joint into medial and lateral compartments. Fenestra A vertical septum pattern that contains a hole or defect. This type of plica is only seen on rare occasions; its incidence being well below 1%. Synovial plicae mostly are asymptomatic and of little clinical consequence. However, they can become symptomatic when they are injured or irritated. This can be the result of various conditions, such as direct trauma or blow to the plica, blunt trauma, twisting injuries, repetitive flexion and extension of the knee, increased activity levels, weakness of the vastus medialis muscle, intra-articular bleeding, osteochondritis dissecans, torn meniscus, chronic or transient synovitis, When the initial injury has healed, patients can be symptom-free for some time, but then suddenly anterior knee pain can develop week or over months later. The term plica syndrome is used to refer to the internal derangement of the knee caused by an inflammation or injury to the suprapatellar, the medial patellar or the lateral plica, or a combination of the three, and which prevents normal functioning of the knee joint. The medial plica is known to be the most commonly injured plica due to its anatomical location.The infrapatellar plica is normally not implied in the occurrence of the plica syndrome. The plica syndrome is thus often the result of excessive use of the knee and is therefore often encountered in people engaged in exercises involving repeated flexion-extension movements such as the ones seen in cycling, running, team sports, gymnastics, swimming and rowing sports and is particularly common in adolescent athletes. The reported incidence for synovial plicae shows a wide variation, as does the incidence for plica syndrome. These differences are mainly the result of interpretations by the individual investigators and differences in nomenclature and assessment procedure. When a plica becomes pathologic, the usual characteristics of the tissue will change due to the inflammatory process. They may become hypertrophic, show increased vascularity, hyalyinisation and lose their typical characteristics as loose and elastic connective tissue. As a result they may also become edematous, thickened and fibrotic, and they will most certainly intervene in normal patello-femoral movement. Chronic cases will show fibrocartilaginous metaplasia, increasing collagenisation and calcification. Particularly the medial patellar plica may bowstring across the trochlea and the medial femoral condyles or impinge between the medial patella facet and the medial condyle when flexing the knee. Over time this might lead to softening, degeneration (chondromalacia) or even erosion of the cartilage of the medial patellar facet and the trochlea. The plica will intrude in the patello-femoral joint (usually between 30° and 50° of flexion), further subluxing over the medial femoral condyle. The same mechanism can be seen with a pathological lateral plica, but in that case the lateral femoral condyle will be affected. A pathological suprapatellar plica will impinge between the quadriceps tendon and the femoral trochlea. Plica syndrome can cause a series of symptoms, such as pain, clicking, popping, effusion, localised swelling, reduced range of motion, intermittent medial joint pain, instability and locking of the patello-femoral joint. It is more commonly seen in teenagers and young adults, even more so in women than in men. Patients often report that symptoms are absent in the early phases of sporting activities, but can come up suddenly and worsen progressively. They are often accompanied by a pain which can be described as intermittent, dull and aching and which will aggravate when performing patello-femoral loading activities such as walking up or down stairs, squatting, kneeling or after holding the knee in flexed position for some time. When the symptoms occur they are not easily distinguishable from other intra-articular conditions and knee derangements of the knee joint.The pain can be located at different places like the supra- patellar and the mid-patellar region when extending the knee. You can also hear cracking noises when flexing of extending the knee.The combination of contracting the quadriceps and the compression of the supra-patellar pouch can also be the cause of pain.What occurs frequently in patients with plica syndrome is that they often have a sense of instability when walking upstairs, downstairs or slopes. It should only be considered as the primary cause of the patient’s symptoms when the patient fails to respond to appropriate management of patellofemoral pain. As the symptoms experienced with pathological plicae are not specific, the diagnostic procedure should keep a high level of suspicion and ideally work through exclusion, to differentiate from any other knee derangement. Physical examination: not give exclusive results due to possible tenderness of the antero-medial capsule or the area around the suprapatellar pouch on direct palpation. Provocation test: Provocation test which simulates conditions that can lead to the occurrence of symptoms could be applied. These results will be considered positive if the symptoms resulting from the tests are similar to the symptoms the patient is usually experiencing. Yet as similar symptoms may also be associated with other conditions of the knee joint, this method will not give an unambiguous result either. Radiography will be of no diagnostic value to determine whether patients suffer from plica syndrome, as the radiograph will be negative. Yet, radiography can be helpful to rule out other syndromes where the symptoms are common with those of a plica syndrome (see differential diagnosis). If there is symptomatic plicae, it will demonstrate hypertrophy and inflammation. This will lead to thickening and eventually fibrosis. If the fibrosis is significant, changes in the articular surface and the subchondral bone may occur. Arthroscopy can be helpful because plica syndrome is often confused with chondromalacia or a medial meniscal tear. Lateral pneumoarthrography and double contrast arthrography have been used with varying success. In combination with CT, it can not only visualise the plica, but it also demonstrates whether or not impingement is present. However, currently it has gone out of use because of problems to obtain reproducible and reliable results and the exposure to radiation. Nowadays, the best results are obtained through MRI Scans. Most cases of plica syndrome do not absolutely require MRI, but it can help to rule out other pathologies that can cause knee pain. An MRI can excludes bone bruises, meniscus tears, ligament injuries, cartilage defects, OCD lesions,… that may masquerade as plica syndrome. MRI is useful to evaluate the thickness and extension of synovial plicae and it can also detect a pathologic plica, particularly if an intra-articular effusion is present. Knee Injury and Osteoarthritis Outcome Score is a measuring instrument that can be used to evaluate the course of knee injury and treatment outcomes. One of the most important points in diagnosing medial synovial plica pathology is obtaining an appropriate history from the patient. The pain is often described as a dull pain in the proximo-medial aspect of the knee and along the border of the patella. Frequently there’s is an internal hydrops and a string palpable.The pain increases with activity, overuse and is practically bothersome at night. Most patients have complaints when doing stairs, squats and standing up from a chair because these movements create a stress on the patello-femoral joint. The patient may also complain of pain following prolonged periods of sitting. About 50% of the patients let us know that they have been doing exercises with repetitive flexion and extension. Injury or overuse of the other plica can cause the same complaints but these are seen less frequently. Specific physical tests for the diagnosis of a medial plica include the plica and the mediopatellar plica stutter tests. Yet, the plica stutter test will not work when the joint is swollen. Other methods of examination that may indicate the presence of a medial plica include the medial subluxation test, McMurray’s, Appley’s test for instability and Cabot’s test. The MPP test is conducted with the patient in supine position and the knee extended. Manual force is then applied to the inferomedial part of the patellofemoral joint with the thumb, checking the presence of tenderness. If this tenderness clearly diminishes at 90° of flexion while applying the same manual force, the test is considered positive. When compared to arthroscopy, the sensitivity and speciﬁcity of this test were 89.5% and 88.7%, respectively, with a diagnostic accuracy of 89.0%. Other provocation tests for the diagnoses of medial plica syndrome can be the knee extension test or flexion test. For the active extension test, a quick extension of the tibia is performed as if making a kicking movement. The test is considered positive when painful, because of the abrupt tension on the plica from the quadriceps femoris muscle. The flexion test is performed by quickly swinging the tibia from a position of full extension into flexion and interrupting the swing between 30 and 60° of ﬂexion. The test is again positive when painful, as the plica is then stretched with eccentric contraction of the quadriceps muscle. The plica snap test can be used to verify if there is irritation of the medial plica. For the palpation of the medial synovial plica the patient lies supine on the examining table with both legs relaxed. For the medial synovial plica the examiner palpates the ligament by rolling the fingers over the plica fold, which is located between the medial border of the patella and the adductor tubercle region of the medial femoral condyle. Under the finger, which rolls directly against the underlying medial femoral condyle, the ligament will present itself as a ribbon-like fold of tissue. The test is positive when it reproduces the symptoms such as a sensation of mild pain. But also compare it with the normal knee to see if there is a difference in the amount of pain. It is demonstrated that it can be quite painful in some patients because the medial joint and synovium is well innervated. The treatment of a plica syndrome should initially be conservative in providing relief from symptoms by rest, using NSAIDs and applying physiotherapy. In case this treatment does not result in improvement or in case symptoms aggravate, the physician can use intra-plical or intra-articular corticosteroid injections. However, this approach appears to have better results in young people and in patients with only short-term symptoms. If non-operative measures fails, surgery should be considered. This is often the only option if the condition has become chronic and/or the plica has undergone irreversible morphological changes. The surgery will involves an arthroscopy where the plica is removed. It is important to have the entire plica removed, in order to avoid fibrosis or reformation of a plica-like structure followed by recurrence of the pain and symptoms. However, capsular integrity and retinacular structures should be carefully maintained while resecting the plica, as injury might lead to patella subluxation. Another possible complication often seen with plica surgery is excessive intra-articular bleeding. Therefore, haemostasis using electro-cautery is recommended during surgery to avoid postoperative haemarthrosis. Prior to the synovial plica resection, it is also important to first address possible other intra-articular pathologies which exist in the patient. It might also be necessary to remove the retinacular bands completely to guarantee success. Postoperative rehabilitation after plica resection usually goes quickly. Physical therapy is recommended starting 48 to 72 hours post-op, to prevent intra-articular scarring and stiffness. NSAIDs can be prescribed to reduce the risk of intra-articular fibrosis and to protect against plica recurrence. Most patients can resume sporting activities within 3 to 6 weeks. Yet, some variability in recovery time is possible and patients should make sure to allow full recovery before restarting physical activity or sporting. Conservative treatment of the synovial plica syndrome first consists of pain relief with NSAIDs and repeated cryotherapy during the day using ice packs or ice massage, to reduce the initial inflammation. Other measures will include limiting aggravating activities by changing the daily physical movements to reduce repetitive flexion and extension movements and by correcting biomechanical abnormalities (tight hamstrings, weak quads). Additionally, microwaves diathermy, phonophoresis, ultrasound and/or friction massage might be considered. Friction massage is also used in this therapy to break down scar tissue. Occasionally, immobilization of the knee in extended position for a few days can be helpful, as well as avoiding maintenance of the knee in flexed position during longer periods. Once the acute inflammation is reduced, physical therapy can be initiated, aiming at decreasing compressive forces by stretching exercises and by increasing quadriceps strength and hamstring flexibility. This treatment is usually recommended for the first 6-8 weeks after initial examination. The key components of the rehabilitation program will involve flexibility, cardiovascular condition training, strengthening and return to ADL. An exercise to regain flexibility in extension is the supine passive knee extension exercise while placing a foam roller under the ankle. Gravity will help to stretch the knee in maximal extension. If possible you can make the exercise more difficult by putting weights on the anterior sight of the knee. Prone passive knee extension exercise, laying down on the belly, with knees over the bench (unsupported leg). Also mini-squats, a walking program, the use of a recumbent or stationary bicycle, a swimming program, or possibly an elliptical machine are the most successful rehabilitation programs. Rehabilitation programs will have the greatest success when focussing on strengthening the quadriceps muscles which are directly attached to the medial plica, and when avoiding activities which cause medial plica irritation. The most important part of the quadriceps to train is the m. vastus mediale. Full range of quadriceps training is not recommended because these create excessive patellar compression at 90°. Instead straight leg raises and short-arc quadriceps exercises at 5°-10°, also hip adductor strengthening should be performed. Other exercises to be performed are squad, go up and down the stairs and lunging forward.. Other important components of this treatment are a stretching program for these muscles(quadriceps, hamstrings and gastrocnemius) and knee extension exercises. The goal of these knee extension exercises is the strengthening of the tensor musculature of the joint capsule. But if the patient has too much pain when reaching terminal extension, then this should be avoided. This conservative treatment is effective in most cases, but in some patients a surgery is necessary. In this case a post-operative therapy is necessary. The post-operative treatment is identical to the conservative treatment and is usually started 15 days after the surgery. The main goal of physiotherapy in plica syndrome is to reduce pain, maximise the ROM and increase the strength of the muscles. The type of plica, the age of the patient and the duration of symptoms will greatly influence the success rate of conservative non-operative treatment of plica syndrome. It is generally believed that infrapatellar and lateral plica syndrome are not very responsive to physical therapy and will normally require surgery. Success of conservative therapy is also more likely in younger patients with only short duration of symptoms, as the plica will not yet have undergone morphological changes. In general, the overall success of non-surgical treatment is relatively low and complete relief of symptoms is only rarely achieved. Irha, & Vrdoljak. (2003). Medial synovial plica syndrome of the knee: a diagnostic pitfall in adolescent athletes. JOURNAL OF PEDIATRIC ORTHOPAEDICS-PART B , 44-48. Kenta, & Khanduja. (2009). Synovial plicae around the knee. The Knee , 97-102. Lipton, & Roofeh. (2008, Juli). The medical plica syndrome can mimic recurring acute haemarthroses. HAEMOPHILIA , pp. 862-862. Tindel, & Nisonson. (1992). The plica syndrome. ORTHOPEDIC CLINICS OF NORTH AMERICA , 613-618. Yilmaz, Golpinar, Vurucu, Ozturk, & Eskandari. (2005, Oktober). Retinacular band excision improves outcome in treatment of plica syndrome. INTERNATIONAL ORTHOPAEDICS , pp. 291-295. ↑ 1.0 1.1 & Roofeh. (2008, Juli). The medical plica syndrome can mimic recurring acute haemarthroses. HAEMOPHILIA , pp. 862-862. ↑ , & Roofeh. (2008, Juli). The medical plica syndrome can mimic recurring acute haemarthroses. HAEMOPHILIA , pp. 862-862. ↑ & Roofeh. (2008, Juli). The medical plica syndrome can mimic recurring acute haemarthroses. HAEMOPHILIA , pp. 862-862. ↑ Tindel, & Nisonson. (1992). The plica syndrome. ORTHOPEDIC CLINICS OF NORTH AMERICA , 613-618. ↑ 8.0 8.1 Tindel, & Nisonson. (1992). The plica syndrome. ORTHOPEDIC CLINICS OF NORTH AMERICA , 613-618. ↑ 9.0 9.1 9.2 Kenta, & Khanduja. (2009). Synovial plicae around the knee. The Knee, 97-102. ↑ 10.0 10.1 10.2 Kenta, & Khanduja. (2009). Synovial plicae around the knee. The Knee, 97-102. ↑ Kenta, & Khanduja. (2009). Synovial plicae around the knee. The Knee, 97-102. ↑ Ihra, &Vrdoljak. (2003). Medial synovial plica syndrome of the knee: a diagnostic pitfall in adolescent athletes. Journal of pediatric ortopaedics-Part B, 44-48. ↑ Schindler OS. 'The Sneaky Plica' revisited: morphology, pathophysiology and treatment of synovial plicae of the knee. Knee Surg Sports Traumatol Arthrosc. 2014 Feb. 22 (2):247-62. [Medline]. ↑ 15.0 15.1 15.2 15.3 15.4 15.5 15.6 Dupont JY. Synovial plicae of the knee. Controversies and review. Clin Sports Med. 1997 Jan. 16(1):87-122. [Medline]. ↑ Yilmaz, Golpinar, Vurucu, Ozturk,& Eskandari. (2005, October). Retinacular band excision improves outcome in treatment of plica syndrome. International Orthopaedics, 291-295.